Welcome to another edition of Becoming A Modern Man! 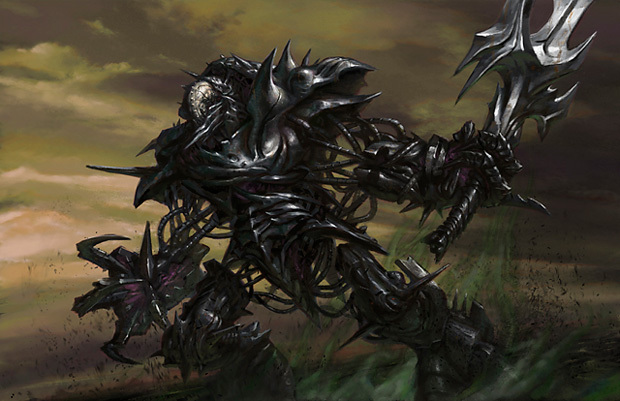 In this article I am going to be looking at Mono-Black Infect, a deck that proved quite popular for a time in the MTGO Dailies. It's also an attractive deck to try out while I wait for the reprinted Ravnica duals in Gatecrash to come down in price. 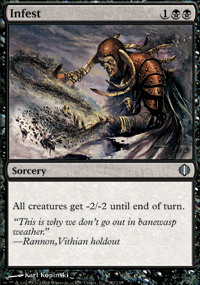 Mono-Black Infect is probably the closest thing to Mono-Black Control I've seen be successful in the Modern Dailies. How good is it though? Well let's try and find out. I didn't find this list until I started making my videos so the list I've been using is below. Ultimately, it's very similar except it runs 2 extra lands in place of a Doom Blade and a Disfigure, which is in the sideboard. I've been happy with the decklist below but I don't know if it's preferable to cut two lands. The deck is largely a combination of hand disruption, removal and some difficult to deal with Infect creatures. 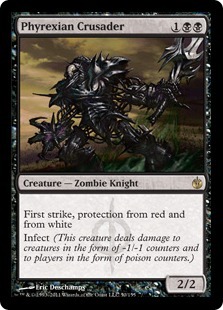 Phyrexian Crusader is a nice card in Modern. It's far from impervious to removal but it does resist Lightning Bolt and Path to Exile which are two of the most popular removal spells in the format. Also, even if your opponent doesn't happen to be playing those colours you have equipment to make the Crusader a bigger and more formidable threat. Phyrexian Vatmother is an interesting inclusion. Vatmother saw very little play in Standard but it's actually fairly decent here, perhaps because it isn't generally dealing with Titans etc. The average creature size in Modern is much smaller than Vatmother and so Vatmother has a good chance of being able to get in against opponents. 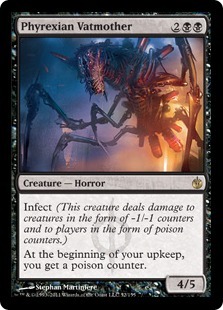 Obviously, you run the risk of poisoning yourself thanks to Vatmother giving you a poison counter on each upkeep but hopefully with the support of your hand disruption and removal you should be infecting your opponent faster than Vatmother is infecting you. I've seen other creatures used in this slot including Plague Stinger, so it's worth experimenting but I'm going with the Vatmother here. Provided that your opponent isn't running a large number of artifacts, Wrench Mind is probably the most powerful discard in Modern. Two mana to make your opponent discard two cards is approaching a Hymn to Tourach level of goodness. Raven's Crime is nice early discard spell while also giving you something to do with your late game lands. Repeatable discard is always good and fits nicely here. Obviously, Deathrite Shaman can put a stop to your shenanigans but you're not losing a whole lot if your opponent does this. Inquisition has been a premier discard spell since it was printed. 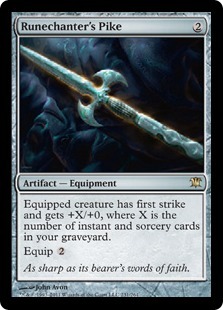 It's particularly good in Modern where the majority of spells have a CMC of 3 or less. Inquisition has the advantage of being targeted unlike the other discard spells in the deck, so you get to look at your opponent's hand and pick the card you want which is nice. Funeral Charm can be discard or removal against any 1 toughness creatures, of which there are many to be concerned about in Modern e.g. Dark Confidant, Noble Hierarch. It can also make one of your creatures unblockable if your opponent controls a swamp but that tends to come up less often. 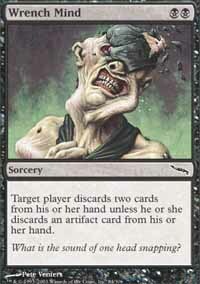 Go for the Throat is probably the preferable 2 mana black removal spell of choice in Modern. It is obviously fairly redundant against Affinity but you have other ways to deal with that type of deck, such as Infest post board. 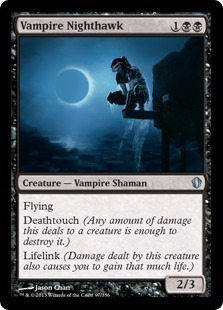 Being able to hit black creatures can be significant, particularly with creatures like Deathrite Shaman and Dark Confidant hanging around in the format. 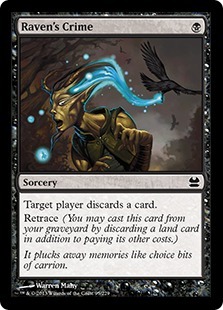 Disfigure is a cheap and efficient removal spell in a format with a lot of low toughness creatures. The fact that it is so cheap means you can often remove a creature and make your opponent discard in the same turn, which can be very useful. Sign in Blood is a solid draw spell. Actually Night's Whisper might be the better card in this slot as it has a less intensive black mana cost and you are unlikely to be targeting your opponent with Sign in Blood as you're looking to poison them rather than damage them. Really I don't think it makes a lot of difference and Sign in Blood is fine. The life loss is a little unfortunate against Burn decks but considering this deck doesn't run any fetchlands or duals, losing 2 life to draw doesn't seem so bad. Runechanter's Pike is a very powerful equipments and one that works very nicely here as you'll be throwing a lot of spells in the bin. Other equipment is available and perhaps trying out Swords, for example, might be an interesting experiment. Personally, I've been happy with Pike even if it isn't quite so good in the face of a Deathrite Shaman. Inkmoth Nexus is one of the primary ways you win the game. Thanks to its evasive nature Inkmoth can slowly Infect your opponent or it can get in for one big hit if you happen to have a Runechanter's Pike. Howltooth Hollow was a surprising inclusion in this deck. I have to say so far in my playtesting I haven't been able to activate it as much as I'd like but I think it is a decent option for the deck. Not quite as good as Windbrisk Heights in its respective deck but decent. Urborg isn't strictly necessary in this deck but it can useful in helping you play the multiple spells in your deck that require black mana. Allowing your Inkmoth to tap for black can help considerably if, for example, you want to Sign in Blood and Wrench Mind on the same turn. Vampire Nighthawk is a decent body. It can help prevent aerial threats and can also act as a way of gaining life. A nice card against aggro decks. Lashwrithe is a card that I don't think belongs in this deck. I've seen other builds of this deck which use Lashwrithe as their main piece of equipment which is fine but I think you either need to cut the Howltooth Hollows or add another Urborg, Tomb of Yawgmoth to make sure that Lashwrithe is of considerable size when you play it. 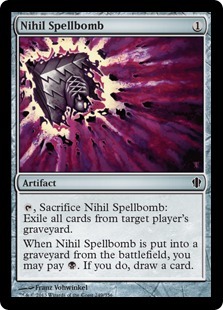 Nihil Spellbomb is a decent graveyard hate card that can also cantrip so as not to dilute your deck too much. If you're really worried about graveyard-based strategies I think Leyline of the Void is probably the better option but I guess it's matter of preference. Infest is useful against token decks and most of the aggro decks in the format. 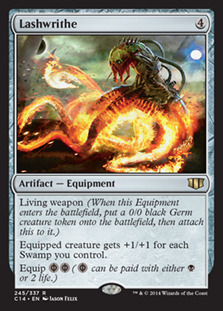 Any deck that drops a lot of creatures can be a pain as it can hamper your Infect guys getting through. Infest is a nice way to clear the way, even if it does kill your Phyrexian Crusader if it's on the board. The fourth Disfigure and Go for the Throat are in the board for when removal is particularly important. This deck is pretty budget friendly, particularly as it doesn't require access to Ravnica duals or fetchlands. 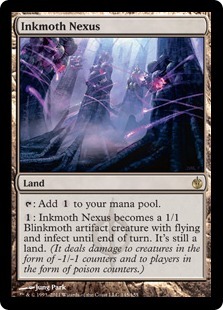 The biggest expense by far is Inkmoth Nexus, though I think it's well worth it as the staple of any Infect deck. 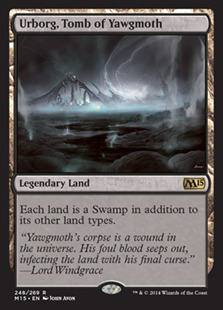 The second most expensive card is Urborg, Tomb of Yawgmoth which can easily be cut for a Swamp if you are looking to make the deck that bit cheaper. My first matchup is against R(b)DW. This matchup can't be a little hairy but hand disruption is very effective against Burn as they are really looking to throw their hand at you in the early going. Phyrexian Crusader can stop pretty much any of their creatures and is impervious to all their burn spells, which makes him awesome on offensive or defensive duty depending on your need. My second matchup is against UWR Midrange. I've bumped into a quite a few decks of this type recently and fortunately we have a pretty good matchup against it. Unfortunately, some bad decisions and a bit of bad luck cause me to lose this match but I've faced this deck a number of times and usually coming out on the winning end. Their removal is very bad against Phyrexian Crusader which is a major upside and if you can stick it you should be in for a fairly easy time of it. Thirdly, we have a matchup against Eggs. I don't come up against this matchup that often and so I'm not sure how good the matchup is but it doesn't seem great. I certainly managed to slow down my opponent here with my discard spells but ultimately couldn't seal the deal before they were able to combo. Adding Surgical Extraction, Memoricide and/or Leyline of the Void to the sideboard might help out if this matchup became a problem though. My fourth matchup was against the lesser played Tron deck, UW Tron. In both matchups we end with a ton of hand disruption and manage to wreck my opponent's hand before they can do too much meaningful. I also manage to deal with everything my opponent does throw at me and finally win out with one of my Infect guys. I have one last video but sadly I wasn't able to record audio for it. This matchup was against a Birthing Pod deck and we managed to do pretty well. From looking at the decklist, I wasn't convinced I would enjoy this deck. In my experience, since Wizards forced MBC to be good back in Torment, it's generally looked better than it is and I felt this deck would be similarly underwhelming. Fortunately, I was pleasantly surprised and thoroughly enjoyed playing this deck. It had a lot more game than I thought it would with Phyrexian Crusader being the real all-star, though Inkmoth Nexus also pulls its weight. Crusader is very difficult to deal with for most decks and can take a lot of games on its own, while Inkmoth gives you reach when you're running low on action. Overall, the deck performed solidly and has some pretty good matchups. I would definitely recommend this deck if you're looking for something a bit different in Modern. Managed to take down Eurodrive 1.63 with the list in this article, so the deck seems to work nicely. Clever build and excellent plays, congrats. Well Kuma sorry to be a dream crusher but as this was my first win with any deck I'm not too sorry, haha. Also, according to Gatherling your my biggest rival as I'm only 1-2 in matches against you, so you still have the upper hand there. One additional comment that I missed in the article. It's important to remember that Funeral Charm is an instant and so you can actually force your opponent to discard at instant speed. This means that if they have no cards in hand you can stop on their draw step and make them discard their card before they can play it, provided it can't be played at instant speed. It's a play that I found very useful whilst running the deck. Hello and thank you for the interesting series of Becoming A Modern Man articles. I just came around back in the game after 7 years so the modern seems to be the format for me. 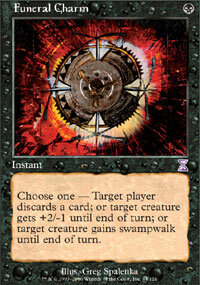 There are plenty of playable cards that I known throught the Mirrodin Timespiral timespan. Reading the articles has been great to get into the fun of playing modern. After playing the MBC infect deck for a while I'd like to discuss about it. I am thinking how Devour Flesh would work out? Life gain is not that big of an issue here. It would be good againts the decks running hexproof men with many enchantments and urzatron which tend to cast out single wurmcoil engine quite fast. Also now that the UrzaTron seems to rise in numbers on the field maybe Rain of Tears would be something to consider as an SB option? Have you came up to do any changes to the build in the list above? Hey. Thanks for the comment and I'm really glad you enjoy the series. I haven't played the deck that much recently, particularly not since Tron became so popular, so your ideas are interesting to me. Devour Flesh seems like a solid removal spell for the deck, as you say we don't really care about the life gain on their side. I would definitely try it out, maybe in the slot of Go For the Throat, or run some number of each. It's still not a great answer to an early Wurmcoil Engine, as they still get the tokens, but it does better than Go For the Throat clearly. I wasn't too happy with my sideboard, as I think I might have mentioned. 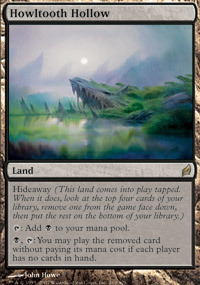 In particular, I felt Lashwrithe wasn't all that good considering how many non-Swamp lands we are running. Rain of Tears seems a solid choice in a Tron heavy metagame and I would certainly endorse it as a sideboard option. Off the top of my head I can't think of any further changes I would make to the main deck. Generally I was happy with the list though I'd be interested to hear your experiences have been with it. After some play I started thinking that I want to make the maindeck build more balanced. Too often I did get over top of the game playing aggressive discard and creature control but then not having any threats bashing down the way to the victory was frustrating. 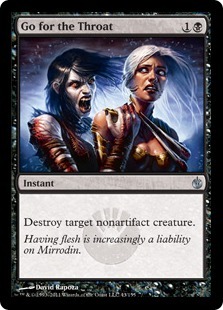 Devour Flesh is good since there are also plenty of other removal that leaves you quite a bit of control which creature opponent has to sacrifice. I thought maybe a just few more creature to do the trick. So after all thinking and playing I have a build like this at the moment. So, at the end there's only 2 more creatures compared to the original build but that is nevertheless 20 percent more. At this point I like the idea of having 12 cards of each segment (discard, removal and infect) available in balance together because I cant yet make difference which would be more important to the other. In practice all of them are needed during the first 4 turns. Funeral charm is a interesting card here since it can be used for each segment: card discard, removal or +2 infect damage. Havent gave a swampwalk to any creature yet but thats a trick not to forget. There are plenty of swamps out there. The tomb would be good for this purpose but yet I havent got to buy it and add to the list. To make this build faster I have thought about going back to running sign in blood instead of underworld connections. Also it often feels that Runechanters pike a bit slow so more aggressive choice would be simply putting Bone Splitter instead. Now, I could go on more about in detail on card by card but I think its better leave it for later. Some interesting ideas here. I'll have to go back and play the deck some more. I definitely like the addition of Devour Flesh. I also hadn't thought about using Funeral Charm as way to pump your creatures. That's an interaction that I was missing so thanks for bringing it to my attention. Regarding Underworld Connections, I've seen people play Phyrexian Arena in this deck which is probably marginally better (though it does have the disadvantage of not having an off switch when your life become low). Runechanter's Pike can be slow but it is very powerful when it works, the first strike it grants can also be very relevant. Bonesplitter is an interesting cheaper alternative. Worth a try for sure. At the end its all about the tempo of the format. Runechanter's Pike is certainly more powerful card here to the deck but one has to be able to keep up with the tempo to gain the advantage. Thats good point with Phyrexian Arena. Propably that would be better choice than underworld connections since it doesnt take the one mana for the card. But then it takes two turns to gain a card advantage which Signed in Blood would give straight up. So its a question of tempo versus power again here. Thinking about the gameplay I dont see one wants the game go too long since there arent any set control conditions that opponent couldnt come back to the game. Once the board is in control one really wants to close down the game as soon as possible. If you get more play with the deck it would be interesting to reading your thoughts how the deck runs in the current modern metagame. Which cards fit the best to the format etc.